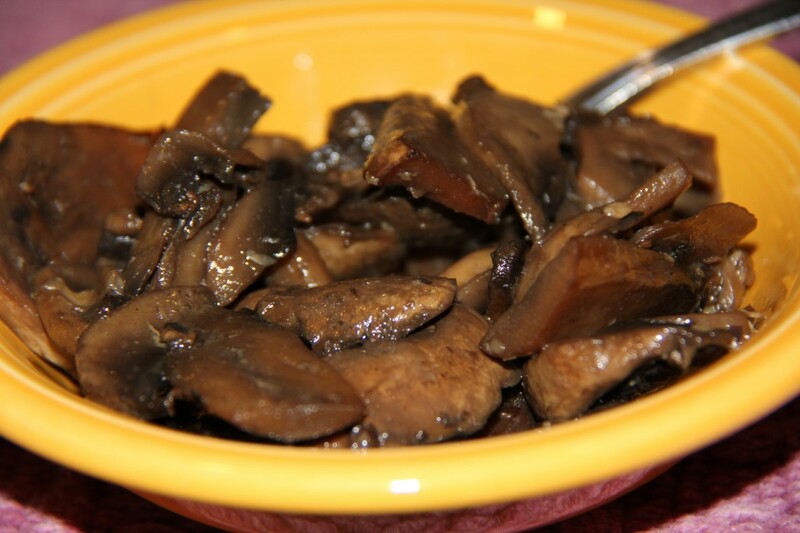 Mushrooms are super healthy and so delicious. After hearing Dr. Michael Greger discuss the cancer-fighting properties of all mushrooms, especially white button mushrooms, I decided to make an extra effort to eat more of them. Of course, they are best for your body if eaten raw, but they’re still good for you cooked. This recipe is super easy and the dish can be served hot, right out of the pan, or chilled and added to salads for a little extra chewy kick of taste. Heat oil in frying pan, add onions and garlic and cook until slightly brown. Add chopped mushrooms and Braggs/Tamari and stir quickly. Reduce heat and cover to simmer slowly for about 15 minutes, stirring as needed. Remove lid and turn up heat, carefully allowing liquids to cook off, leaving mushrooms and just a little liquid broth. Serve hot or chill to serve later on salads. This entry was posted in Recipes, side dishes and tagged cooking vegetables, Dr. Michael Greger, fungus, gluten-free, glutenfreevegan.me, glutenfreeveganme.com, health, healthy, mushrooms, recipe, salad, vegan cooking, vegan recipes, veggies, white button mushrooms. Bookmark the permalink.